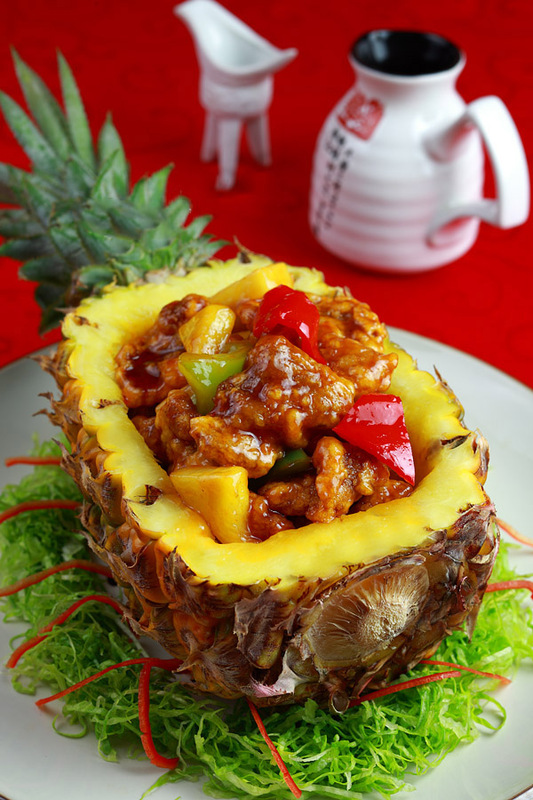 Sweet and Sour Pork with Pineapple is a famous dish of Cantonese cuisine. It is also a hong kong style version. It is not only sweet and sour, but also the pork is crispy outside and tender inside, suitable for both young and old. It is served in a pineapple boat, with green and red pepper- this makes a very colorful and appetizing display. 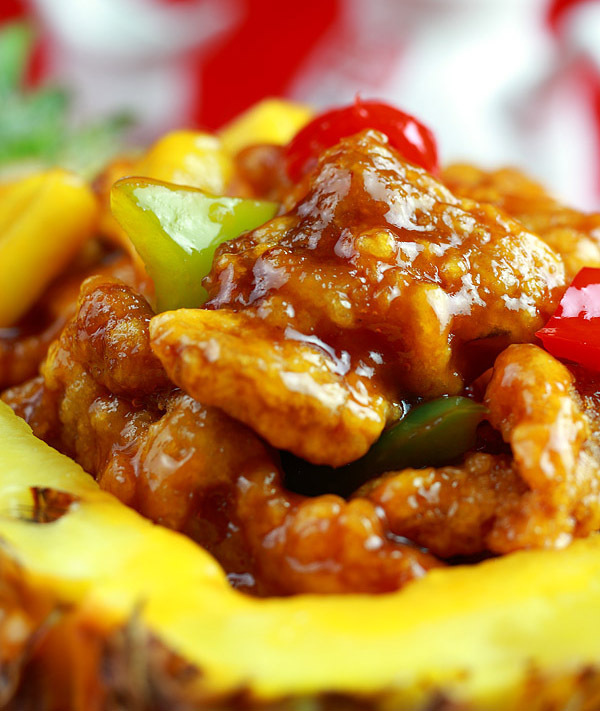 Sweet and Sour Pork with Pineapple is a must-have dish on my New Year’s Day table. 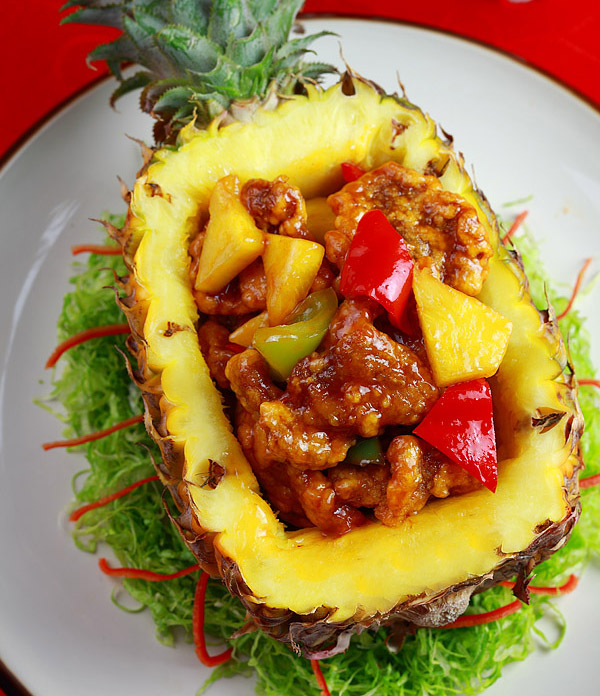 With everything being bite-sized, coated in sweet and sour sauce, served in a beautiful pineapple, it will be hard for anyone to refuse jumping right into eating this! 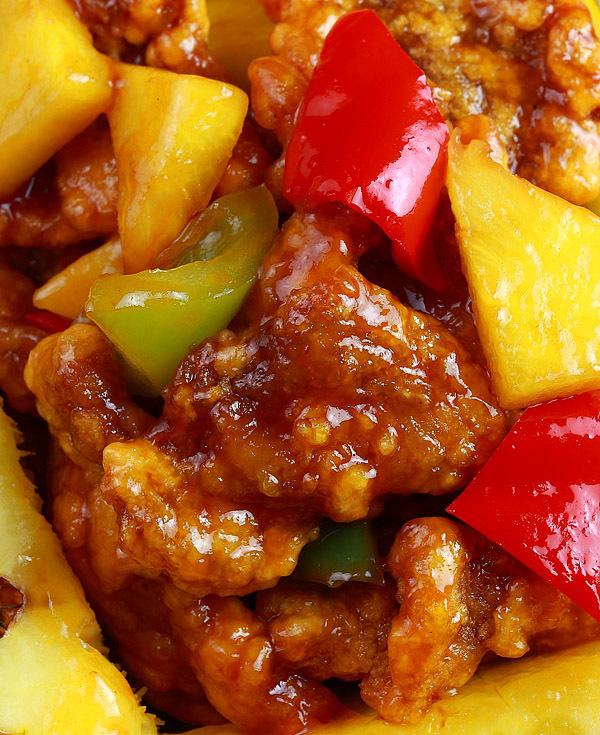 The most traditional approach to the sweet and sour pork with pineapple and green peppers is to flavor with sugar and vinegar. Some restaurants will follow the traditional method, adding hawthorn slices or pickled plums to add flavor. However, the home version of Sweet and Sour Pork, for the convenience of preparation, will now basically add tomato sauce to color the seasoning. This version I made, also used ketchup. It is not that I am lazy, it is because I also serve cut pineapple in the pork and peppers, and ketchup really brings together the sour and sweet this way. In order to really set off the refreshing fruity flavors, I made another small improvement. I replaced the white vinegar with lemon juice. The ratio of ketchup and sugar was also adjusted. The taste was fresher and the meat taste was not overpowered by the sweet and sour sauce. In China, we emphasize the appearance of the dish, so for this recipe, I use the pineapple as the plate to serve the dish. Step 1. The pineapple is cut at the 1/4 position (as shown below), and a rectangle is cut out on the surface to dig out the pineapple meat. Step 2. Cut the pieces of pineapple meat into chunks. Step 3. Add a pinch of salt and sugar to the clear water and pour in cut pineapple for half an hour. Tips: Soak the pineapple with salt water to reduce the acidity of the pineapple and make it sweeter. Step 6. Add 1 tsp of light soy sauce, 1/4 tsp of salt, sugar, ground black pepper and 1 egg yolk to the pork, mix together and let stand for 15 minutes. Step 7. Mix 1:1 starch and flour in a bowl, evenly coat the meat with a thin layer. Step 8. Heat the oil in the pot for about 3 minutes to get it up to temperature. Fry the pork in the pan until it floats. Remove with a strainer and set aside. Step 9. Then add the pork again in the strainer as shown below until golden, and remove. How to make Cantonese sweet and sour sauce. Step 10. Put 2 tablespoons of cooking oil in a hot pan, add 2 tablespoons of tomato sauce, 2 tablespoons of crushed rock sugar, stir fry sugar in oil until it begins to turn into a red sauce, add 1/4 teaspoon of salt to taste. Step 11. Put the pineapple in and stir fry for to heat it, add 3 tablespoons of water/starch and add a few drops of lemon juice. Step 12. Cook until the sauce is thick, add the peppers and the fried meat, stir fry so that all the ingredients are evenly coated and the sauce is thick. Add the meat and pepper and stir fry quickly. Otherwise, the pork will not be crispy anymore. Which cut of meat should I choose for Sweet and Sour Pork with Pineapple? 1. The traditional cut of meat is usually the fat and thin pork belly. 2. You can also use tenderloin. Sometimes the pure lean meat is more enjoyable.